Browse our amazing selection of Jewish books and gifts for all ages, denominations, families, etc. Visit our gift and ritual shop and sign up for our gift registry for your forthcoming simcha. Check out our Synagogue Shop, for special items for your synagogue or school. Phone us for any additional information you can not find on our site 800-626-6536. Round discs of anodized aluminum and polished chrome. A magnificent papercut of five superimposed layers. Alljudaica.com was launched in 1996, as the internet division of Rosenblum's World of Judaica, Inc. Established in 1941, we have been selling Jewish books and Judaica in Chicagoland and throughout the country for over 7 decades. We look forward to welcoming you to our retail store, located at 9153 Gross Point Road, in Skokie, Illinois. Both our retail and internet stores are fully stocked with a complete selection of Judaica ritual items and gifts for all occasions. We make every effort to offer you the latest in Judaica. We are available to assist you in selecting gifts for any occasion. Phone us at 800-626-6536. Feel free to ask us questions about any of our products. This Shop offers items which are specifcally used by synagogues. 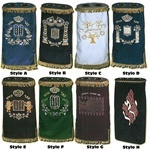 Included are ritual items for all holidays and occasions, as well as our complete selection of accessories for Torah scrolls, and synagogue rituals.